The village of Banstead is nestled on the north downs and is bordered by large areas of land with Metropolitan Green Belt status. It sits the county of Surrey just a couple of miles from the border with London. The first recorded mention of it was in 967 AD, and it appeared in the 1087 Domesday Book as Benestede. Banstead currently has a population of around 16,000 people. To the south east of the main village area is Banstead Woods. The woods cover 250 acres and are classified as ancient woodland which means the area has been continuously wooded since at least 1600 AD. Many hundreds of years ago, the woods were owned by the Crown and were enclosed as a royal deer park under the name Banstead Park Estate. The last Queen to own the woods was Henry the VIII's first wife, Catherine of Aragon. In 1841, while under the ownership of the Spencer family, the estate was renamed Banstead Wood. Later on the woods came into the Baring family (founders of the now collapsed Barings Bank) who built a large house within the woods. The building subsequently became The Queen Elizabeth Hospital for Sick Children and has now been converted into flats. In 1939, during the Second World War, the woods came under to control of the War Department and was used as a camp for the Canadian military. Later on in the war, the woods were used as a prisoner of war camp called 'Westonacres Camp No.239'. In present times, the area is known as 'Banstead Woods and Chipstead Downs Local Nature Reserve' (LNR), and is also a Site of Special Scientific Interest (SSSI). I was of course here for Banstead Woods parkrun, which is one of the grand old parkruns - in fact when it had its inaugural run back in 2007 there were only two other venues, Bushy and Wimbledon. It was set up by Chris Phelan and back then would have been known as Banstead Woods Time Trial. At time of writing, it has the longest-standing (male) course record which was set on 7 June 2008. Banstead holds a special place in my own parkrun history as it was the location of my first (and second) ever parkrun back in May 2011, and for a while I had it officially set as my home venue. I also ran here as part of my New Year's Day double (unofficially a triple) in 2014. Back in 2011 my blog posts weren't quite as detailed as they are now, so when, in February 2018, I had a nearby afternoon cross-country race, I thought it would be nice to go back, see some familiar faces and update the blog. I drove to the venue and parked in the Holly Lane Car park which is free-of-charge. However the main event car park is at Park Farm, which is just a little further along Holly Lane (and closer to the start). If I had travelled by train I would have headed for Chipstead Train Station. For the record there is a train station in Banstead, but this is significantly further away. There are some cycle racks located within the Holly Lane car park. On your first visit here, you may need to follow other participants in order to find the meeting point, but don't worry, there'll be plenty of people heading in the right direction. By the way, I'm not aware of any toilet facilities at this venue. The start of the run is located in a slightly different spot to the finish, so leave a few extra minutes to walk around to the start area, which is half-way up a hill (incline). Once the run briefing has taken place the participants, 141 on this occasion, are sent off on their Saturday morning 5k around the woods. The course is just under two anti-clockwise laps of the woods. Underfoot is woodland trail paths with some tree roots and stones mixed in, so that means dirt when it's dry and mud when it's wet. On this occasion, I ran in a mixture of the two which wasn't too bad, but I have run here in very challenging, splashy, muddy conditions. Trail shoes are my preferred option on this course at all times of year, but road shoes are absolutely fine when it's dry. The beginning can be a little congested as the path immediately narrows down a little after a few metres. However the path soon opens back up which gives plenty of space for participants to settle into the appropriate position in the field. As far as features to look out for around the course go, the last surviving pond in the woods is located next to the second corner (the southern tip of the course) - it was restored in 2011. There were once seven ponds, dug in medieval times to provide drinking water for the hunted animals (deer). On the subject of features, Banstead Woods is very well known for its bluebells and people specifically come here in spring to see them. 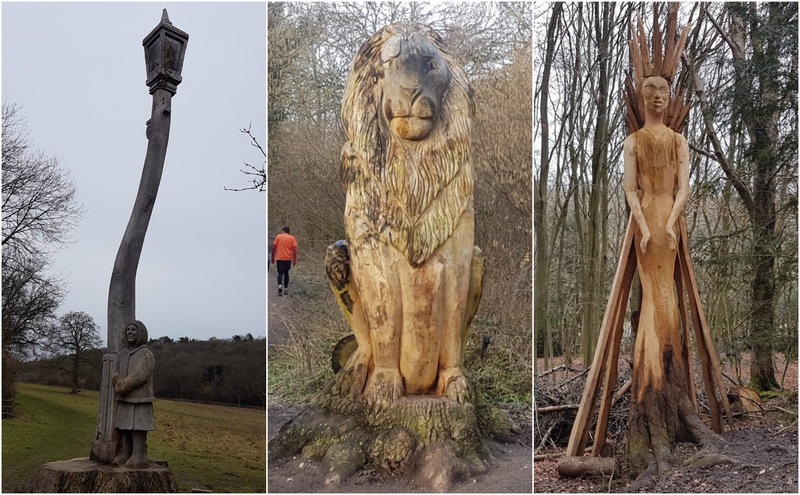 It's also worth noting another recent feature installed in the woods - The Narnia Trail is a series of wooden carvings from C.S Lewis' books, so you'll get to come face-to-face with the lion, the witch and the wardrobe (and Lucy)! Lastly, the woods are home to the Roman Snail, which has a white-ish shell are protected under the Wildlife and Species Act 1981. However, they are edible and people are known to illegally collect these for use in restaurants. The paths are mostly pretty straight lines and even on the narrower sections are still wide enough to accomodate a couple of runners side-by-side. The course is shaped almost like a rectangle, but it might be better described as an irregular quadrilateral, trapezium or possibly even a parallelogram. However, I'm not an expert in geometry so I'll leave it at that. The corners (4 of them, of course) are all very clearly marked with large arrows, and occasionally you'll see a marshal too. The hill profile caught me out on one of my earlier visits because with the run starting over half-way up, it's easy to forget that there is one to climb. So after passing the finish area towards the end of the first lap and turning the corner, it can be a bit of a shock to the system. The climb is easily the trickiest part of the course, so along with having drag yourself up, the surface underfoot is very uneven with all sorts of rocks protruding. In fact I wouldn't be surprised if this is the remains of an old road of some kind (I can't find anything to confirm this, but maybe one of the locals will be able to shed some light on it). The course does give back what it took going up the hill and most of the final kilometre is downhill (also most of the 2nd kilometre). In fact the configuration means that this is a 'net downhill' course - however you still have to get up the hill so I wouldn't necessarily expect to run any quicker because of this fact. So with the almost-two-lap course complete, the fabulous finish funnel team will be awaiting your arrival with encouragement and smiles. Barcode scanning takes place at the original meeting point and you get a little clue that this is one of the grand old parkruns as the scanning points are still fondly known as 'registration'. Post-run, the team move on to The Mint pub to process the results and have some refreshments. It's a short drive to get there but very worth it. I was also pleased to hear the call of 'RESULTS!' once they had been processed, it's only a small detail, but it's something that I found really nostalgic. After being made to feel very welcome (thanks for the tea) and chatting to a few people I hadn't seen for quite some time, I had to hit the road to Sparrows Den for the final KXCL cross-country race of the season. I had recorded my run using my Garmin and you can see the course route and profile via my Strava account. I also used the data to create a course fly-by video using the Relive app on my phone.